I received a lot of emails about the Chimichurri Sauce from my lamb chop post, so I decided to do a post focusing on this delicious condiment from Argentina. According to my friend who is Argentinean, this sauce is a perfect expression of traditional cuisine, where a protein is simply salted, cooked and seasoned with herbs. Chimichurri can be used as a sauce for a variety of foods and also makes a great marinade. Also, with the garlic, parsley and lemon juice, this sauce is perfect for the upcoming flu season. Chimichurri Sauce is traditionally prepared with steak (especially skirt steak), however it can be used to season just about anything. And don’t be deterred if you are a vegetarian—this sauce is great over grilled vegetables or tossed with grains or pasta. For this meal, I decided to pair it with my favorite fish, halibut. Halibut is a sweet white fish that is firm and easy to cook. It is nutrient-dense, providing high levels of protein, selenium, magnesium, phosphorus, potassium and B vitamins. Halibut, like other cold water fish, is known for its beneficial Omega-3 essential fatty acids. Omega-6 fatty acids are plentiful in the American diet and it is important to eat enough Omega-3’s to keep a proper balance between the two. A lack of this balance promotes inflammation which contributes to many chronic diseases. Getting enough Omega 3’s is important for heart health, stroke prevention, lowering cholesterol, cancer prevention, improved mood, as well as healthy hair, skin and nails. Combine the first six ingredients and let sit for at least 2 hours before serving. Simple! Meanwhile, prepare grill pan by brushing it with oil. Then place on the stove over medium-high heat. Pat fish dry, then brush with extra-virgin oil and sprinkle both sides with salt and pepper. Grill fish, turning once, until just cooked through. This should take about 8 to 10 minutes total. Remember, once you put the fish down, don’t move it until you are ready to turn it or it will stick. Serve fish drizzled with some of the chimichurri sauce and serve the remainder on the side. Halibut for lunch now! Making me hungry for halibut, great recipe! Yum, I love chimichurri — goes so well with so many things! Great robust flavor. I'm getting hungry just looking at your post! oh, i love chimichurri!!!!! i put it with any seafood dishes! did u try squids? it's perfect! your fish looks really yummy! Your chimichurri is beautiful, and it looks like a great recipe to use things from the garden. I've never had chimichurri with fish, but this looks fantastic! Can't wait to try it. Oh wow, I never knew how to make this sauce – I'm definitely saving this recipe to my favorites! Thanks! yum – this looks beautiful and amazing – i need to print this one out! @Cajun Chef Ryan: Great! Hope you love it! @wasabi prime: I love chimichurri too…I had it on fried eggs the other day and it was so yummy! @lululu: Thanks!I have never tried it with squid but that sounds amazing! @Vegetable Matter: Thank you so much! I have a cilantro plant and next time I make it I am going to use half parsely and half cilantro. @Simply Life: Great! The sauce goes well on everytthing! @ncl117: Thanks so much! Let me know if you try it! I recently tried the Chimichurri Sauce with a steak and loved it, looking forward to trying with halibut! Sounds absolutely delicious! @Jessie: Thanks! It really does! @5 Star Foodie: Yum! What kind of steak did you use? Fab Fab! Chimichurri sauce looks simple to make and like you said, great as a marinade. Must copy! The dish looks great. A simple way to spice up and flavor your fish or any dish. Great recipe! 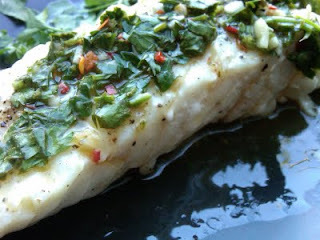 I love halibut and haven't made it in a while – will definitely be trying it soon with your chimichurri sauce. What a lovely recipe for Halibut, and the chimichurri sauce sounds delicious. A healthy , nutritious and best of all delicious meal. Great blog you have here , Thanks for sharing! @Marillyn Beard: Great! Happy to help…it really is super easy to make. @penny aka jeroxie: Yes, so simple. Let me know what you marinade it with! @Spicie Foodie: Thanks for your sweet comments! Cooking fish any which way isn't one of my best skills, but I'm encouraged by the NOM! you've set before my eyes….and Chimichurri is such a cool word. @ Yum Yucky: Glad I got a NOM! I hope you give it a try! This looks wonderful- and I'm always looking for new fish recipes – I get stuck in a rut and sick of them!